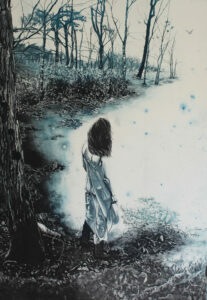 Aoife Scott started her study of art with drawing and design, but found her real passion in printmaking. We asked her about the journey from student to professional artist, her practice, and the life of an artist. SO: When and how did you know you wanted to be an artist? Aoife Scott: I always knew that I wanted to go to art college. When I began my core year in NCAD I thought I would go into design, either Printed Textiles or Visual Communications, but I enjoyed the print modules so much that I decided to specialise in Printmaking. However, it wasn’t actually until towards the end of my fourth year, in the lead up to my degree show when I saw all my work coming together for the exhibition that I realised I wanted to make art for a living….to be an artist. SO: What made you decide on printmaking? Aoife Scott: I really enjoyed the intaglio module we did in core year and after deciding to specialise in print my main focus for the remaining three years was on intaglio. I loved the idea of being able to work into and rework a copper plate, layering lines, tones and adding textures. Making the copper plates is my favourite part of the process. Also, my strength and love has always been drawing, so I liked that print lends itself very well to this. SO: Which artists, whether printmakers or any medium, inspire you the most? Aoife Scott: Norman Ackroyd, Michael Goro and Niamh Flanagan are a few printmakers who have really inspired me and my work in the last few years. Also, I have always loved the etchings of Matisse and Picasso and the beautiful work of Egon Schiele and Hope Gangloff. SO: What inspires or informs your work? Aoife Scott: I have always been drawn to derelict buildings and structures, whether it is an old cottage, shop front, abandoned bath tub or a forgotten boathouse. I get excited when I walk into a space and see little reminders of what once was, and then I begin to form memories, whether they are real of fantasy. I try to imagine who lived there or what the space was used for. Often, when I am exploring these abandoned spaces I am reminded of my own past, so the merging of memories is something that inspires my work. My work also reflects a journey, the journey I am taking to become an artist, which strives for a purpose and a place in society. I navigate through past and present moments, searching for clarity and meaning. The feeling of wandering and searching is quite strong in my work. SO: How has your process changed from graduation to being a professional artist? Aoife Scott: I am still working in intaglio, but my printmaking techniques and skills have improved hugely since graduating. I have learnt so much from working in a professional environment such as The Graphic Studio for the last two years. Printing and working alongside successful artists who have been working in print for years can been slightly intimidating at times, but from asking questions and watching them work my skills and knowledge are improving everyday. SO: What advice would you give young artists starting out? Aoife Scott: One piece of advice I would give is that if you really want to be an artist and succeed you need to really commit 100%. I left my part-time job recently, which was the best thing i could have done for my career. I may not have a steady income, but I am now 100% focused on my art. I have more drive and motivation to become a successful artist and to make a living from it. Also, try to apply for as many exhibitions and residencies that you can. Building up your CV and getting your name out there in the first few years after college is really important. Also, try to stay connected with the art community. SO: Can you describe a normal day for you, whether you are in the studio, drawing or meeting with galleries? Aoife Scott: At the moment I am working towards a few exhibitions so I am quite busy. I try to get into the studio most days. If I am printing, I like to go in really early or late in the evening when it’s quiet. It’s nice to have the studio to yourself. If I am drawing onto my plates I usually work from home. I like get up at around 6.30am, when my concentration is at its best and draw for four to five hours. I also try to get to a life drawing class every week. At the moment I am doing the tutored life drawing classes in the RHA once a week, which are great. Then whenever I have free time, I try to get to current exhibitions taking place in Dublin. Thursday night openings are great for making connections with others artists and a nice way to meet up with old friends from college. Aoife Scott will give a printmaking demonstration in the gallery on Saturday, 12 September, as part of Dublin Gallery Weekend. Follow our Facebook, Twitter and Instagram for more news on the demonstration and future events at SO Fine Art Editions.